The growing application of TNT as explosive in the military munition, mining and in a deep well and underwater blasting is key areas driving the market application. Increase in spending by various governments over the defense and national security is driving the market growth. Ongoing activities for innovation of advanced explosion technologies are further contributing the market growth. TNT posses high explosive power, chemical, and thermal stability, better compatibility at a relatively lower cost has increased its application in military ammunition, high explosive shells, and bombs. The latest report by Value Market Research expects the Global Trinitrotoluene Market to reach USD 513.2 million by 2025. It was valued USD 390 million in 2018. The report foresees a 4% CAGR from 2019 to 2025. On the basis of type, military-grade emerged as the leading segment in 2018. Increase in spending on military and national security by the governments to ensure safety is driving the market growth. Ongoing R&D for the development of more efficient explosion technologies is fueling the segment growth. In 2018, Military dominated the application segment and has accounted for maximum market share. The increased threat of terror attacks has generated a high demand for advanced ammunition and defense equipment. This is driving the segment growth. Also, increased investment for defense and military is again fueling the segment growth. Regionally, Asia Pacific dominated the market in 2018. Increasing the defense budget on account of rising terror attacks and war conditions in between neighboring nations is driving the regional market growth. Accurate Energetic Systems, LLC, AEL, AUSTIN Powder, BME - Omnia Holdings Limited, Eurenco, Hangzhou Dayangchem Co.Ltd., Hunan Nanling Civilian Blasting Equipment Inc. , MAXAM, Mil Spec Industries Corporation, Nitro-Chem, POLY TECHNOLOGIES INC., Prva Iskra - Namenska, Solar Explosives, and Zarya Ltd. are some of the players ruling the trinitrotoluene market. 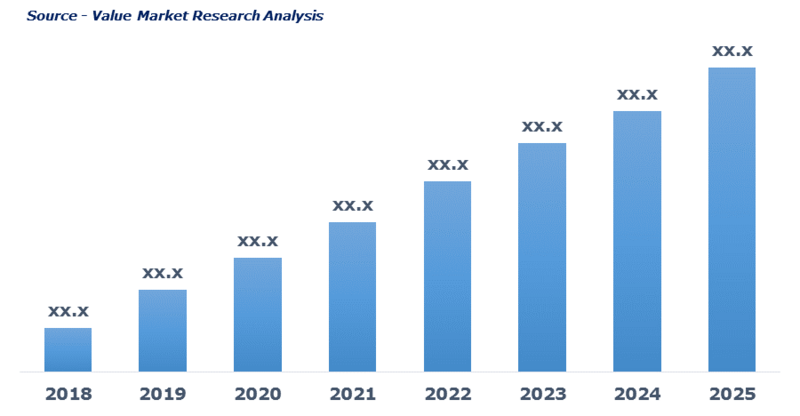 As per this study the Global Trinitrotoluene Market was valued USD 390 MN (by revenue) in 2018 and is anticipated to reach USD 513.2 MN by 2025 with a CAGR of 4%. Trinitrotoluene also referred to as 2-methyl-1, 3, 5-trinitrobenzene, is a chemical compound with the formula C6H2 (NO2)3CH3 and is yellow in color. This yellow solid is used as a reagent in many chemical syntheses, but it is mainly known as an explosive material with extremely convenient handling properties. The explosive yield of this compound is considered to be the standard measure of bombs and the power of explosives. The market of Trinitrotoluene is expected to experience strong growth in the years to come owing to the expanding defense industry for ammunition products against the need for national security and counter-terrorism strategies. Also, continuous innovation in explosive technologies and rise in focus on performance testing of explosives is projected to raise the product demand. Moreover, the growing need for safer explosives to replace high energetic explosives and propellants to meet safety needs is again prompting the manufacturers of military & defense equipment to employ Trinitrotoluene on a large scale. Further growing mining activity worldwide has also raised the demand for Trinitrotoluene. This detailed market study is centered on the data obtained from multiple sources and is analyzed using numerous tools including porter’s five forces analysis, market attractiveness analysis and value chain analysis. These tools are employed to gain insights of the potential value of the market facilitating the business strategists with the latest growth opportunities. Additionally, these tools also provide a detailed analysis of each application/product segment in the global market of trinitrotoluene. The broad trinitrotoluene market has been sub-grouped into product and application. The report studies these subsets with respect to the geographical segmentation. The strategists can gain a detailed insight and devise appropriate strategies to target specific market. This detail will lead to a focused approach leading to identification of better opportunities. Furthermore, the report comprises of the geographical segmentation which mainly focuses on current and forecast demand for trinitrotoluene in North America, Europe, Asia Pacific, Latin America, and Middle East & Africa. The report further focuses on demand for individual application segments in all the regions. The report also covers detailed competitive landscape including company profiles of key players operating in the global market. The key players in the trinitrotoluene market includes Accurate Energetic Systems, LLC, AEL, AUSTIN Powder, BME - Omnia Holdings Limited, Eurenco, Hangzhou Dayangchem Co.Ltd., Hunan Nanling Civilian Blasting Equipment Inc. , MAXAM, Mil Spec Industries Corporation, Nitro-Chem, POLY TECHNOLOGIES INC., Prva Iskra - Namenska, Solar Explosives, and Zarya Ltd. An in-depth view of the competitive outlook includes future capacities, key mergers & acquisitions, financial overview, partnerships, collaborations, new product launches, new product developments and other developments with information in terms of H.Q. Hunan Nanling Civilian Blasting Equipment Inc.